Hi Firehouse Bounce Fans! Today I want to discuss what bounces we have that are perfect for our youngest jumpers. Even our tiniest customers love jumping on our bounce house. We have a few that are geared towards little ones. 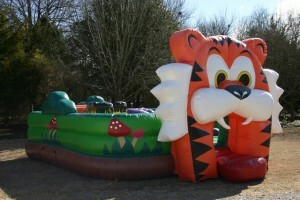 Our toddler safari bounce house is the most popular bouncer for our young crowd. Toddlers love this unit because it has many fun interactive features, but the best feature is it’s open top. Parents can look over the side and see their little ones having a ball. The kids can see their parents and run over to interact with them, so this feature makes both parent and child comfortable. As you probably have figured, our toddler safari has a jungle or animal theme. All kids love animals! The children enter the toddler safari through the mouth of a friendly tiger. Once inside they can climb up on top of the hippo to slide down. They love to show off to their parents how big they are when sliding. There is an orange tunnel to crawl through. There are little inflatable people that act like bumpers. The kids love to run into them and bounce around. There is also a mushroom to climb on as well as lots of open area in which to simply jump around and expend some energy. Another great unit for little kiddos is our Firetruck. Boys and girls both love this unit. It is the shape of a truck, so the kids just love it! It has a slightly smaller footprint on the interior than some of the other units, which makes the toddlers more comfortable. When the bouncer is too big they tend to get overwhelmed and scared, especially if this their first time in a bounce house. When we have mixed age groups, even the older kids get a kick out of both of these jump houses. Just make sure not to allow the ages to mix when inside the bouncer. Have the big kids jump only when the toddlers are done due to safety reasons. The big kids tend to get a bit rough for the little ones. Please contact us personally with any questions! Happy Jumping! Our customers in Wylie are some of Firehouse Bounce’s very first customers. 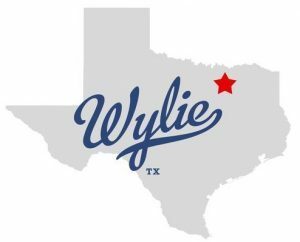 Our company was started there by one of the Wylie Fire Department Chiefs. So y’all are special because you put our business on the map. Thank you for believing in our little company! 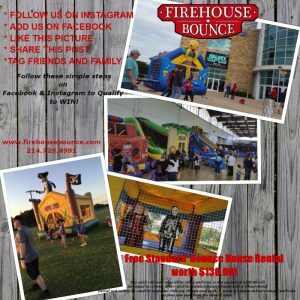 Because Firehouse Bounce was started by a firefighter who serves his community, we felt it fitting to offer our customers who serve our area a discount. This discount isn’t limited to firefighters; we offer it to law enforcement, EMTs, paramedics, nurses, and military. The $25 discount is the least we can do to say thank you for taking care of our citizens. We greatly appreciate all you do for us! Wylie is home to some beautiful parks. And, yes, we can set up any of our dry bounce houses there for you. Give us a few weeks notice and we will handle getting approval from the city. Bounce Houses (dry only) are permitted as long as vendor provides a Certification of Liability Insurance listing the City of Wylie as insured, prior to reservation. Olde City Park and Community Park both have pavilions you can rent and have electrical outlets. If you want us to set up in a park that doesn’t have electricity, no problem. We have generators for rent to take care of that. Just be aware that the pavilions in those parks are first-come first-serve. 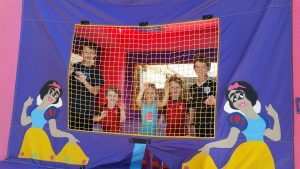 We have the perfect bounce houses for whatever type of event you are planning, neighborhood block party, kid’s birthday party, end of summer party, holiday celebration, or church gathering. We have many different sizes and styles, for toddlers on up to the biggest kids. They can bounce, climb, slide, splash, and have the best of times on one of our many bouncers. Just call us today! In Wylie, you set up the party…we’ll bring the fun! Are you planning an event for a big group of kids? If so, you may need more than just a bounce area for them to play in. We have multiple options with a bouncy area, slides, and climbing walls. 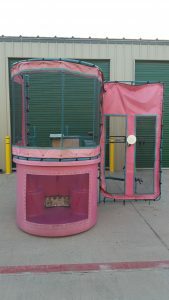 We have two units that also have a ball hoop for a 4 way to entertain your kids. 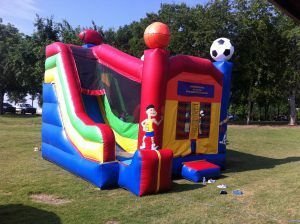 When you rent a combo unit from us, you get way more than just a bounce house. The kids will have multiple activities to keep them busy. The more to do, the more they love it! Do you rent bounce houses with an attached slide? Yes, we do. Our Sports and Jungle 4-in-1 combos have 4 activities, a climbing wall, slide, bouncer, and ball hoop. This can keep the kids busy for hours on end. They will run in circles getting in the unit, bouncing, then climbing up to go down the slide to the outside of the unit and back in through the front to bounce again. They will expend tons of energy, giggling all the way. Our Happy Caterpillar and Race Car combos both have a bounce area, climbing wall, and slide. These two are both unique in their set up. Please see the pictures and videos under the rentals tab for combos. The Happy Caterpillar is one of our most popular units, so if this is the one you want you must act fast. It often rents out weeks in advance. Do you have big inflatable slides? Yes, we have two large inflatable dry slides. They are both the exact same style, but a different color scheme. Both are 20 feet tall. Kids of all ages and adults love these giant slides. Our dry slides have a matching bounce house. If you rent the bounce house and dry slide as a combo you get a $30 discount. We also allow substitutions for the bounce house. You can choose any of the $130 bounce house to go with your dry slide to get the discounted price. What a deal! Rent your combo as soon as possible. All of our combos are popular because the kids absolutely love them. So don’t miss out of your first choice, rent it today! Is your special girl having a birthday soon? Make her birthday party a huge hit with her friends and family by renting a bounce house. Entertaining a bunch of cute, energetic girls is a piece of cake with a princess or castle inflatable. Like we always say, you set up the party…we’ll bring the fun! Girls of all ages love our big, fun inflatables. We have some bouncers with “girl” colors, such as pink, purple, light blue and yellow for those girls that want something pretty. For coed parties, if your daughter chooses one of these cute bounce houses, don’t worry, the boys won’t mind the girly colors. All they want to do is act crazy and bounce! Our Princess bounce house is a beautiful purple, pink, and sky blue castle with snow white pictured on the front. It is totally fit for your princess! 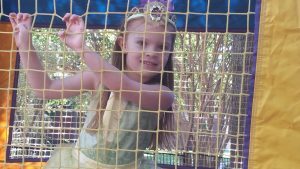 Our Castle bounce house has bright yellow, purple, and sky blue colors. 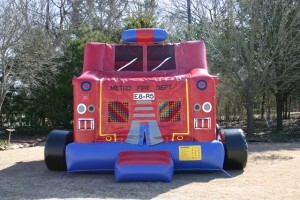 To really rev up the party, rent our Castle Combo which includes a separate large slide that matches the bouncer. This combo will deliver hours of endless entertainment! For our Little Mermaid fans, we have the awesome, bright blue and yellow Sea bounce house. This bouncer features a giant, friendly octopus. They can pretend like they are “swimming” with the fishes in the deep blue sea. We have one more castle jumper, called the Watchtower bounce house. This one has vibrant, primary colors of red, blue, green, and yellow, making it fit for a prince or a princess. Rent the bounce house slide combo by adding the matching dry slide and your party will be one to remember! Of course, all of our inflatables are loved by girls! Make no mistake, a bounce house will be the hit of any party! That is a guarantee! Do you want to rent a bounce house in Royse City, Texas? You have come to the right place. Firehouse Bounce delivers to your town. Just go to the rentals tab on our website and look at all the choices of bouncy houses, bounce houses with slides, large dry slides, and large wet slides. We have some videos posted too, so you can see some of our inflatable lovers in action. 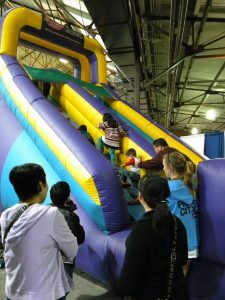 Kids of all ages, even adults love inflatables, so the entertainment part of your event will be covered. Like we say, you set up the party…we’ll bring the fun! All you need to do now is decide which one you want. There are many from which to choose, so take some time to look around at our inventory. We have a bounce house perfect for our tiniest jumpers, called the Toddler Safari. It is a large, open top inflatable that has a tunnel and small slide. Parents love it because you can see you little one having fun and the kids love that they can see you. For our teenage partiers, we have an Obstacle Course through which they can race. At this age, you know it’s all about competition! Teenagers also love our large dry and wet slides. For them, the bigger the better. Quite honestly, younger kids enjoy these larger inflatables too! But none of our jump houses are little; they are all big, commercial sized inflatables. Kids oooh and aaah when they see them getting inflated. They can’t wait to get in! We love to see their excited faces! We enjoy speaking personally with our customers. Pick up the phone and give us a call to discuss your event at 214-729-4991. We are in the office during the week. On the weekends, we are generally out delivering inflatables, but often catch phone calls in between. If we aren’t available, leave us a message and we will call you back as soon as possible. If you already know what you want and have no questions, fill out a reservation form. We take reservations on a first come, first serve basis. We will contact you with an email or phone call within 24 hours. 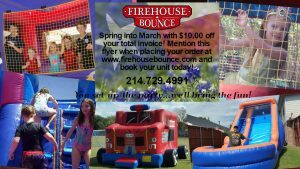 Thank you for choosing Firehouse Bounce! Who is going to be the lucky person that gets dunked in a cold pool of water? Will it be the birthday boy or girl? Maybe it will be your parent, teacher or principal. Whomever it is, they are in for a blast! Getting dunked on a warm summer day is fun! Everyone watching gets a kick out of watching the “dunkee” get sent into the water. You can watch them underwater through the clear plexiglass on the tank. Take some pictures or video and have a laugh later. When choosing your dunkee, keep the following rules in mind for safety. The person must be at least 4 feet tall because they have to be able to stand up in the water. The dunkee must be under 250 lbs per the manufacturer. Set up of our dunk tank is quick. Once we place where you want it, all you have to do is fill it with water. Then it’s ready to go. How much space do I need for the dunking booth? When choosing a spot to place the dunk tank, keep in mind that we set up on concrete. It must be an area wide enough for a 6 foot wide trailer to fit. If there is a gate, we must be able to drive through it with the dunk tank trailer and large pickup truck. We are happy to discuss the event accommodations with you to make sure we have enough room for set up. Please contact us personally at 214-729-4991. We guarantee that our dunk tank will be the highlight of your event. All kids LOVE to dunk their friends. Kids especially LOVE to dunk their favorite teachers. When you rent a dunk tank for your event, there will be lots of cheers and laughter! Our dunking booth is available for rental in Rockwall, Royse City, Heath, Fate, Wylie, Sachse, Murphy, and northeastern parts of Garland. The rental fee for a 6 hour event is $200, which includes taxes, delivery, set up, and pick up. Call us today! And the winner of the Spread the Love Contest is…. Spring into March Madness Special! With Spring Break just around the corner, be sure to book your bounce house soon! While kids are on Spring Break, they are going to want to have an outlet for all that stored energy. What better way to let them blow off some energy than an inflatable? Call us today to reserve your bounce house and receive a $10.00 discount! Remember, at Firehouse Bounce, you set up the party…we’ll bring the fun! Kids know which Bounce House Company ROCKS! At Firehouse Bounce, we LOVE our customers! And they think we ROCK! CONTEST TIME!!! ▪️Make sure to Follow us on instagram @firehousebounce & Like us on Facebook. ▪️Like this photo. ▪️Share this post & Tag as many people as you can. (MUST BE SHARED AS “PUBLIC” ON FACEBOOK.) ▪️Let me know in the comments when you have completed all the steps! Winner will be announced on February 28, 2017. Good luck and remember, at Firehouse Bounce, you set up the party…we’ll bring the fun!